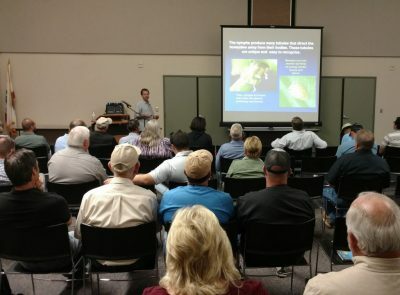 The Spring Citrus Meeting held last week in Tulare County touched on several major issues growers are concerned with, and included presentations on best practices for managing citrus trees. The day began with important information related to Asian citrus psyllid (ACP) and the disease it causes, huanglongbing (HLB), which has been growing at an alarming rate in Southern California during the past few years. The increasing occurrence of HLB in citrus trees was an alarming point discussed at the meeting. However, there was some good news related to ACP. Prior to a focused effort related to the movement of citrus, several ACP finds were happening in different portions of the San Joaquin Valley. Quarantine efforts and increased public awareness seem to have helped reduce the number of psyllids being discovered. “CDFA (California Department of Food and Agriculture) finds it on these traps, but they find one insect here, another one there. They’re not finding that many live populations of the insect. So, it is sporadic, and it seems to be moving along corridors, so it’s probably being moved with people,” noted Douhan. Craig Kallsen, UCCE citrus and pistachio farm advisor for Kern County, presented information on a couple of older research projects that remain relevant to the industry regarding orchard spacing and pruning methods. His studies showed overall yield per acre is less over time with higher density orchards. Another project Kallsen spoke on demonstrated that hand pruning did not increase the number of fruit per tree, nor did taller trees have any notable difference in yield or quality compared to shorter trees. Nematodes were discussed at length during the Spring Citrus Meeting. Information was presented on the life cycle of nematodes and what kind of damage they can cause in agricultural operations. Management techniques and effective nematicide usage information was also provided. In addition, attendees gained information on different pathogens that pose a risk to the California citrus industry. Brian German is a multimedia journalist for AgNet West.